Big Foot and Little Foot and Axel and Beast are two new series for confident young readers comfortable with early chapter books. Both series introduce emotionally engaging boy protagonists and their beastly besties. Written by Adrian C. Bott and illustrated by Andy Isaac, the first installment in the Axel and Beast series, The Grabbem Getaway, is a fast-paced book that introduces readers to Axel Brayburn. Axel is a skilled gamer who spends most of his free-time playing Tankinator Arena. He lives alone with his mother, Nedra, after his father’s sudden disappearance, which is only briefly introduced in the book. Nedra is a hard-working mechanic who cannot afford the game upgrades Axel’s competition, particularly BAGGER-63, take for granted. As a result, although Hugo has tremendous skill, his wealthy opponents claim victory. Axel uses his gaming skills to aid Beast in making his escape. The two are aided by a disgruntled Grabbem employee, Agent Omega, Axel’s mom, Nedra, and Rusty Rosie, owner of the local junkyard. It is a happy ending for all, all the good guys anyway! Beast is saved and his tracking devise is expertly removed. I appreciate any text that encourages critical class-consciousness and creates strong women characters like Nedra and Rusty Rosie. I found the pace and tone of The Grabbem Getaway engaging and think it will likely to appeal to reluctant readers with strong vocabulary and comprehension skills. 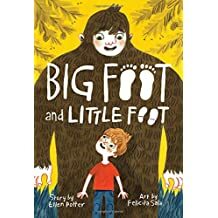 The first two books in the Big Foot Little Foot series, written by Ellen Potter and illustrated by Felicita Sala, deal with the themes of loneliness and being an outsider. The Sasquatch protagonist, Hugo, and the human protagonist, Boone, accidentally meet and eventually become best friends who are as oddly paired as Axel and Beast. Hugo is happy enough in his community of Sasquatches, but he longs for adventure, and is particularly interested in sailing. But, Sasquatches are afraid of humans who they fear wish to hunt them, so they tend to stay very close to home. Boone is a lonely boy who lives with his grandmother and is homeschooled because of the lack of public schools in the rural wooded-area he calls home. He wants to be a cryptozoologist when he grows up. Hugo and Boone begin passing messages to one another using a toy sailboat. In one message Boone confides to his friend that he has seen a Sasquatch. When Hugo shares that he is the Sasquatch, Boone becomes angry assuming that he is being mocked because, of course, Sasquatches can’t write. Both humans and Sasquatches maintain unflattering stereotypes of the other that end up getting between them. However, Hugo and Boone overcome these difficulties and become best friends by the end of the first book. The second book in the series, The Monster Detector, plays with the insider/outsider theme that emerges in the first book. When Boone decides to attend the Sasquatch school, not all the children are willing to accept an outsider within their classroom. However, they eventually become more comfortable with their new human peer. The Big Foot Little Foot series avoids being didactic while encouraging many moments of reflection through Boone and Hugo’s unlikely but convincing friendship. The books are sweet and fun to read. If you are looking for a book about a young boy and his sort of odd best friend, either of these series will excite the young readers in your life. 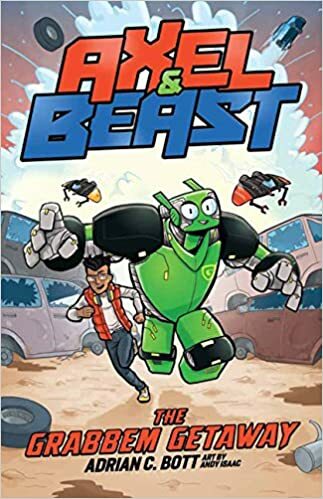 The Axel and Beast series requires greater reader proficiency and is likely to appeal to an older audience, but advanced young readers will surely enjoy it as well!